Home » Celiac Disease » Is Celiac Disease Reversible? Until a few thousand years ago, we thought the world was flat. Around 240 B.C., Eratosthenes broke new ground when he came up with an initial estimate of the Earth’s circumference… later supported in physical theory around 330 B.C. by Aristotle. But there are still people that believe the world is flat (… Google “Flat Earth Society”). As new ideas present themselves, we’re given the rare opportunity to grow into the next higher level of thinking. Medical research is a constantly evolving frontier and it’s our responsibility to take a step back to review our beliefs whenever new discoveries come to light. Back when autoimmune conditions were first recognized over a hundred years ago, we thought it had everything to do with non-self antigens (like virus or bacterial infections). In fact, the condition was originally thought to be an infectious disease explained by the “Molecular Mimicry” theory, in which outside bacteria and viruses invade our body and look so similar to our own healthy tissue that the immune system wages war on both. Molecular mimicry has been shown in animal autoimmune models to INITIATE the autoimmunity. In other words, it’s a part of the development of autoimmune disease in animals. However, recent human studies have shown that molecular mimicry is actually an EFFECT of human autoimmune disease, and not a cause of the autoimmunity. It tells us that molecular mimicry is definitely a factor in the progression of pre-existing conditions that trigger autoimmune disease, but something else is responsible for triggering it in the first place. 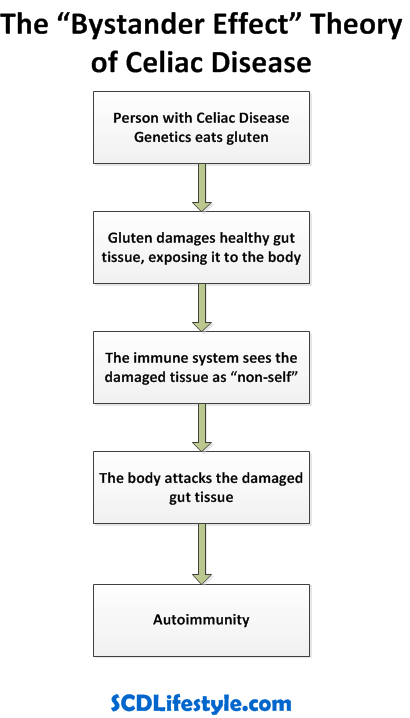 In Celiac Disease, we know that gluten is a non-self antigen that finds its way inside the body and causes cross-reaction… but this evolution in thinking shows this to be only an effect of other pre-existing conditions. So, What Else Could Be Confusing the Immune System? Another theory suggests that non-self antigens come into our body and damage healthy tissues during active infection, exposing it to the immune system. The body sees these newly exposed areas as “non-self,” leading to the development of immune attacks against that tissue. Researcher Alessio Fasano, M.D., has been on the forefront of recent autoimmune and Celiac Disease research. In 2011, he published a paper titled “Leaky Gut and Autoimmune Diseases” introducing a new theory that suggests prevention and reversal of autoimmune disease is possible. 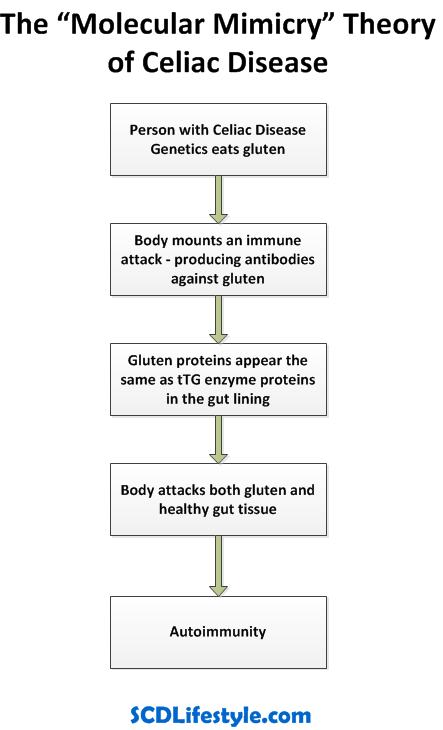 People with the genetics for Celiac Disease that have a leaky gut and eat gluten will develop autoimmunity and subsequent intestinal damage. 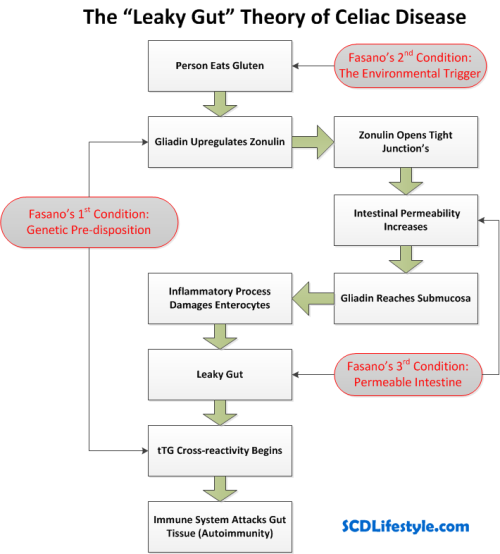 The increased intestinal permeability allows the environmental trigger (gluten) to become exposed to the body and trigger the genetic predisposition. But when I say autoimmune reversal, I don’t mean, “someone with Celiac Disease can eat gluten again.” To me, autoimmune reversal means that the tissues in the body go back to the way they were before the autoimmune process “turned on” in the first place, and normal health is restored. So for Celiacs, that means the gut tissue heals, intestinal permeability is restored, and the finger-like villi become fully functioning again. So, Removing Gluten Should Reverse Celiac Disease, Right? So, what’s the missing piece of this equation? Whether the latest evolution of research stands the test of time is irrelevant, what is relevant is that Fasano’s theory of autoimmunity opened the door to understanding where the Gluten-Free Diet fails to fully treat Celiac Disease and what needs to be resolved to reverse it. In the next post of this series, I reveal which step of the process is broken and why the Gluten-Free Diet fails to reverse Celiac Disease. Thank you so much for the info! I just got done reading your other article on the dangers of gluten. Loved it! But just a quick sidenote on this one. Eratosthenes didn’t “break new ground” realizing the earth was not flat. The prophet Isaiah acknowledged that fact around 700 BC. Obviously just not everyone paid attention! Thank you so much for the work you are doing! I THOROUGHLY appreciate your engineering approach to this complex problem. I am a mom and also an engineer (chemical)…trying to heal my 4 year old celiac as fast as I can, and her two non-celiac sisters also with intestinal inflammation. I have a theory….I suspect copper toxicity is the pre-existing condition that sets off autoimmunity. I am going to post 2 websites that I have been “stuck-on” for a few months now. Maybe you could give them a read and see if you think this theory is a possibility or just plain crazy. We have copper in water supply, moms pass down to babies in-utero and maybe breastfeeding. With each generation, the copper load passed down to babies gets worse. Could explain increasing autism, ADHD, and autoimmune disease rates. 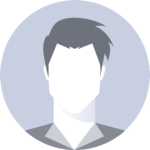 Here are the websites that I have found to be most insightful. I believe this same pre-existing condition may contribute to other autoimmune conditions l(MS, Diabetes type 1, thyroid disease), autism and cancers as well. I am going to submit hair samples to 1 of Dr. Wilson’s practioners and see what their recommendations are for de-toxing. I have stacks of test data and observations. If you think there is something to this, I would be very happy to discuss more. I will continue to follow you on FB… thank you for your work! Both my wife and I have celiac but have made great progress in 7 years with a GF diet, magnesium shots and supplements as well as B shots and numerous other supplemnets including quality acidophilus. As health care practitioners also, we see tons of issues with celiac and non-celiac folks around gluten and wheat intake and the resulting cascade of inflammatory symptoms. It is clear that a GF diet isn’t enough and that MOST of the medical community remains sound asleep about the disease itself and the opportunistic diseases that emerge! 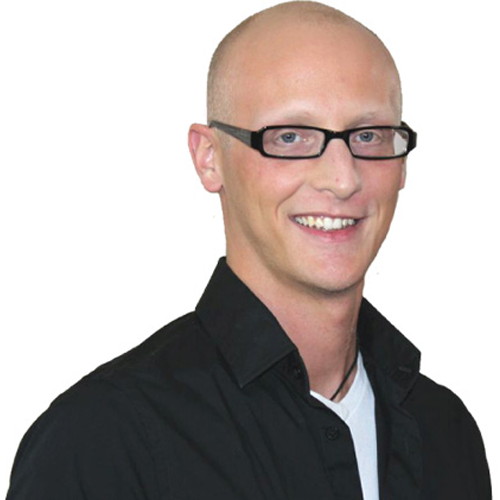 Thank you very much, Jordan for sharing your personal journey and modeling, and your brilliant connecting- of- the- dots for so many others, including me! Bravo! So far the best summary of leaky gut theories I have seen. Thank you! You’re welcome Martin – thank you for the feedback man! I am not suprized that what you say is the case. I have been gluten free and do herbs for relief, I believe that quercetin and guaifenesin help very much, also Echinacea these help with inflammation and allergic response which I felt that wheat caused to the gut. I also take licorice, burdock and dandelion as a tonic for pain. My experience was a downhill spiroll of muscle pain and chronic fatigue syndrome,, I was diagnosed with fibromyelgia. The brain pain and depression lifted with a celiac diet. I eat a lot of beans with turmeric, very comforting. I also think a vegitarian diet is very healing to the system especially if you can start healing from this insidious desease. Jordan I am so impressed with your research. wow!! this is soooo me. I had a positive biopsy for celiacs two years after I stopped eating gluten without doing a challenge… I am also now intolerant to eggs and dairy..thanks to leaky gut. MUST do something about healing it! Thank you for posting this. I am a 21 year old college student who was diagnosed with Celiac Disease a year and a half ago after three tests confirmed it. I am struggling with eating gluten free on a college student’s tight budgets. I am currently eating completely gluten free with parental financial support for the special (and extremely costly) foods. However, I am still very ill and feel worse than I did while eating gluten. I cannot wait for the rest of the posts after reading the previous ones. Hoping I can end this pain and feeling so sick all of the time. I have several autoimmune diseases and it was clear to me after being gluten free for 6 months that wasn’t going to be good enough. I started a Paleo diet a few weeks ago, and getting use to another way of eating…and trying to focus on what I can eat, and not what I’m missing… like carbs and dairy. I also have to follow a low oxalates diet. It’s alot to follow all three diets, but I’m determine to fix my leaky gut. Thank you for this article – it helps me know I’m on the right path to healing. @ Amanda – All the people I would recommend to help you, as a first step will put you on either SCD or Paleo autoimmune diets (basically the same thing) so get started this week with our free guide to SCD (http://www.scdlifestylebook.com/free.php). Then as far as people who can help via the internet check out chriskresser.com. Good Luck you can do it, hang around the blog and facebook for a ton of like minded people to support you. I think you are right on target that all prolamins need to be eliminated for healing to happen, but I’m wondering if that “elimination” is enough. I suspect that adding key “leaky-gut” healing elements is necessary as well – such as bringing vitamin D up to therapeutic levels, bringing zinc levels up if deficient, adding proline proteins (gelatin/bone broth/colostrum PRP) and re-populating gut flora with beneficial bacteria (SCD yogurt/lacto-fermented veggies/key probiotics). LDN fits in there as well. Thoughts? Great points Alan – stay tuned, we’re nearing the prescriptive portion of the series… just a few more posts to go. clamoring for the next post! you elucidated and broke down those first two theories into plain english better than anyone else i’ve ever read, and i’ve read quite a bit! a unique skill and so wonderful that you are putting it to good use. it is worth saying, without responding to anyone specifically, that the diet based approach can be scary to discover when the doctors you trust are telling you the *exact* opposite. for anyone who feels immediately skeptical or threatened it helps to remember that the doctors, who no doubt have the best of intentions, are working only from theories themselves; there is no deep understanding of AI diseases in the mainstream medical field and needless to say a cure is nowhere even near the radar. Even the most establishmentarian doctor would admit that immune-suppressing drugs and tnf antibodies etc are just band-aids. I write this as a 10 year Crohn’s sufferer (dealer-wither? i hate ‘sufferer’) who loved his dietary routine deeply and was relieved when my doctor told me to ‘eat whatever i want, it doesn’t matter’. only problem was i stayed sick until i made the fundamental and difficult changes to my diet! you guys are doing great work and helping more people than you probably realize. i found out about your site from ‘crohnsdad.com’ and think he is a godsend as well. thanks so much! @MGH – thank you so much for the kind words, I really appreciate it. Helps me stay motivated to get the rest of this series going (got lots more coming)! Thank you for the info. It is honestly a bit over my head, but I am wondering if you have looked at using low dose naltrexone to treat autoimmunity. It is an off label use of a drug that multiplies the body’s own endorphin production…not sure how it would impact the celiac process but it is doing amazing things for ms and many other diseases. Hi, what other efforts besides going gluten free have helped? I’m researching various options that is like to employ. Also, how does one’s body absorb iron and other nutrients once the villi in the small intestine are destroyed? Thank you so much for this great article. Can’t wait for more to come. Too bad doctors dont ‘get it’ when we tell them that gluten free works for them but there could be another missing link. However, eating gluten free has dramatically changed my life for the better – I don’t mind the once in awhile episodes, it is better than everyday! It should be made more clear that this research and your opinions at this point in time are not facts and much more research is needed before it should be presented in such a way. I really think overall what you guys are doing is great however sometimes it boarderlines on misinformation. Thank you for your blog post. This makes so much sense. From my own experience of being gluten free for 4 yrs, I’ve realized that I am just doing patch-work and that the disease underlying is not being healed (as evidenced by a new auto-immune disease). Your blog post helps me understand my own experience much better. Thanks a lot for this excellent explanation! Thank you! Thank you!! Can’t wait for your next blog post….